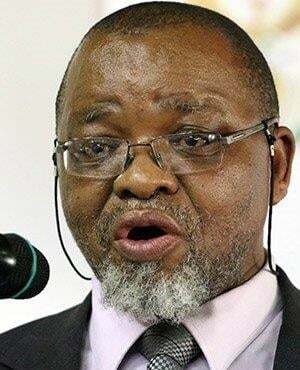 Minister of Mineral Resources Gwede Mantashe (Gallo). "Why do you refuse to hold mining companies accountable? Answer me and stop 'mantashing' me," Nkagisang Koni of the EFF told Minister of Mineral Resources Gwede Mantashe on Thursday. Mantashe attended a session of the National Council of Provinces to reply to questions from members. Koni was not satisfied with the answers Mantashe gave on the issue of non-compliance of mines to social labour plans. When she repeatedly made her dissatisfaction known, she was requested to leave the session. Mantashe said government is not in the business of closing mines, but of ensuring they operate while complying. "Only as a last resort will a mine be closed. We want mining companies to comply and produce. It should not be about withdrawing a licence, but about engaging with a mining company about compliance. Only in a very extreme situation can it be that a licence is withdrawn," said Mantashe. "Saying that a company is non-compliant is a tool we can use. The primary objective is not to close mines, but to see that they operate and comply. Many companies comply once we tell them they are not compliant and that they must correct it." He added that government is engaging with communities in mining areas to increase awareness of what the new Mining Charter involves and what their rights are. "Any company, whether local or international will be treated by the same rules in the process of granting mining licences. If Chinese - or any other international companies want to come and invest, we welcome them. We want to remove uncertainty in the mining industry," said Mantashe. "Our view is that foreign direct investment is welcome in SA. Mining must make a positive contribution to the economy." He said the essence of the Mining Charter is clear about ownership, procurement and community development. "To transform the mining industry, it must not just be a white industry, but a South African industry to which every South African has access," said Mantashe. "At the same time, those choosing to remain outside the formal mining industry are criminals. We cannot make provision for illegal mining in the Charter."